Searching for clues to her murder, D’Eon discovers his sister’s life in the King’s court was more than jeweled gowns and priceless perfumes. It involved dark sorcerers, manipulative royals, and a violet-eyed vixen whose dangerous power turns innocent mongrels into slobbering, rabid monsters. So D’Eon and his comrades slip from Versailles to Russia, seeking an Emperor who appears to control magic-wielding followers. And serving a Queen who seems far too pleased to have Lia’s spirit possess her brother’s body. A tormented beauty’s soul is not resting in peace, but is alive and well – and looking for vengeance. Le Chevalier is really a mixed bag. The fighting scenes, when they appear, are the best that anime has to offer. Unfortunately, there are only one or two (depending on your definition of fighting scene) in this volume. The rest of the anime is taken up by lengthy discussions about the best way to chase the Russian guy and take back the stolen Psalms. But the actual point in doing so still sort of escapes me. D’Eon and the crew are trying save France’s monarchy by stopping the poets, but where the heck are the poets getting their power? Random magic? And Lia is also just magically possessing D’Eon? It seems like the characters all just take this crazy stuff that’s happening as fact. I myself am not interested in the survival of the French monarchy. I already know when the French Revolution takes place anyway. I want some more explanations and more sword fighting, not more genuflection and French period political drama! ADV must like Chevalier a lot, because they packed this DVD with a ton of extras. There’s some audio commentary by the English VAs (didn’t listen to it) and a translated promo event video with some dudes from Production I.G. There’s also the standard stuff you’d expect on a DVD (OP, ED, previews). Strangely, the commentary track of the two boring historical ladies didn’t show up on this volume. I have a feeling their commentary was at least more insightful than the VAs. There’s also a really sweet booklet with more info on the characters, their designs, and general stuff about the series. It’s nice to see this much work being put into an anime release. It’d be nice if all releases had this much extra stuff. Perhaps I’m not mature enough to really enjoy Le Chevailer. But is it truly wrong to pine for more swordfights against zombie dogs vs. intense double entendre political threats? I don’t think so. The animation is great, so why waste it on CG Chandeliers!? I really, really hope the next episodes will feature more action. 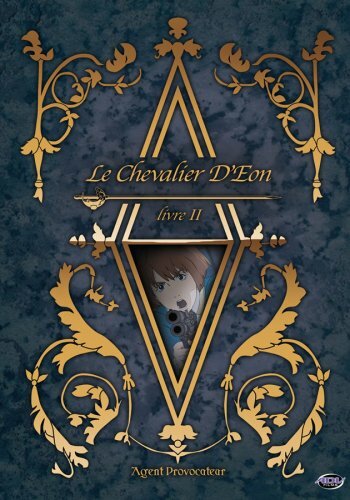 Many thanks to ADV for sending me a review copy of Le Chevalier D’Eon – Agen Provocateur (Volume 3)!